From what could have been. On real graves of real people. where she ushered in white. Hot and dark, but hers. Because that’s what she had to do. She mostly sits and sleeps. 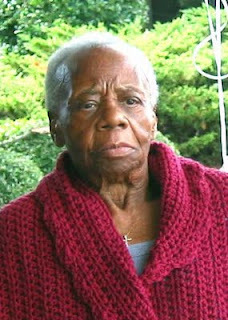 Mrs. Edna Jordan, my wife Anne's adopted mother, was born in Southampton County, Virginia in 1916. Known to friends and family as Miss Edna or Aunt Edna, she now resides in Smithfield, Virginia. She has Alzheimer’s disease. This is for her. Click here or on the graphic at the left for more impressions. .. what a lovely poem .. Such a lovely tribute to a great woman. A beautiful tribute. It touched me. the best we can give to our beloved is a beautiful tribute, such as this! This was so touching to read...she sounds like a strong and amazing woman. This touched my heart. How time shapes us as we shape time. And time is not always kind. This was powerful. This touched my heart, and reminding me of so many Edna Jordan, and the love they gave to unwanted, unloved, or children that had no one. Thank you for sharing this ... such a beautiful and loving tribute. Along with that picture, I almost think you could have stopped the poem at "A strong woman born" What an amazing line! Thank you for sharing this lovely poem in tribute to Mrs. Jordan. Wonderfully done. This is a wonderful tribute to your mother in law. It touches the fragility in life, for me. It inspires me to live fully each day. Thank you. This is a wonderful tribute to a lady who lived a very heart filled life and I am sure many have loved her. This is beautiful, your gift to Mrs Edna Jordan. How tragic, sad and also triumphant. I wish I could have met her. Thank you, Anne, for passing this on to me. Maurice did a wonderful job of honoring her. I think of my friend, who shared life with two mothers, and can see how she, herself, is a strong and caring person. Miss our dinners! Oh I loved this! What a wonderful tribute to an obviously very special lady in your lives. Nicely done! Your post touched me deeply. My mother in law, Cecilia, so much like what I would imagine Edna was like, salt of the earth, with a generous spirit and strong back, now vacantly “watching the fords go by”. To watch someone you love disappear to herself is bitter fruit. My best to you and your family.